Arkansas' Ten Commandments Monument Lasted Less Than 24 Hours : The Two-Way Police say a man drove a 2016 Dodge Dart into the 6,000-pound granite slab less than a day after it was installed on the grounds of the state Capitol. The man reportedly took video as he accelerated. Staff at the Secretary of State's Office inspect the damage to the new Ten Commandments monument outside the state Capitol in Little Rock, Ark., on Wednesday morning. Police say a car crashed into it less than 24 hours after it was installed. 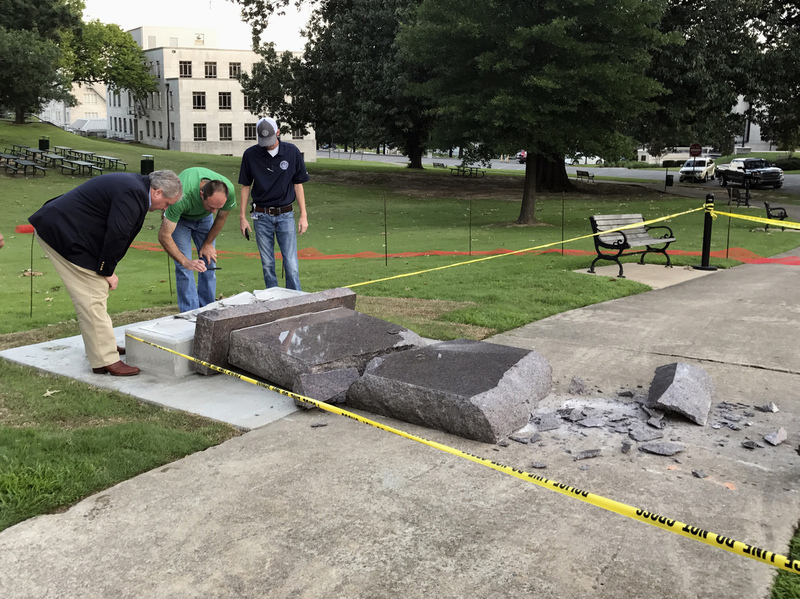 Less than a day after a monument of the Ten Commandments was installed outside the Arkansas State Capitol in Little Rock, it was destroyed when a man smashed a car into the stone. "My boss called me and told me the Ten Commandments monument had been destroyed," Secretary of State and Capitol Police spokesman Chris Powell told NPR. "When I got here, it was rolled over on the sidewalk and broken into multiple pieces." A video that appears to have been taken from inside the car was posted on the Facebook account of a Michael Reed early Wednesday; Powell told the AP that officials believe the video is authentic. It shows what looks like the Arkansas State Capitol building. A man's voice says: "Oh my goodness. Freedom!" as the car careens into the monument. Powell said the crash into the 6-foot-tall slab was no accident. "This was deliberate. The individual drove down there and stopped. He was videoing it on his cellphone as he accelerated into the monument," Powell said. "One of our Capitol Police officers was on patrol and witnessed it." The Tulsa World reported in 2015 that Reed sent the newspaper a letter apologizing for the destruction of the Oklahoma monument. "I am so sorry that this all happening (sic) and wished I could take it all back," Reed wrote, explaining to the World that he had begun to believe the voices in his head. 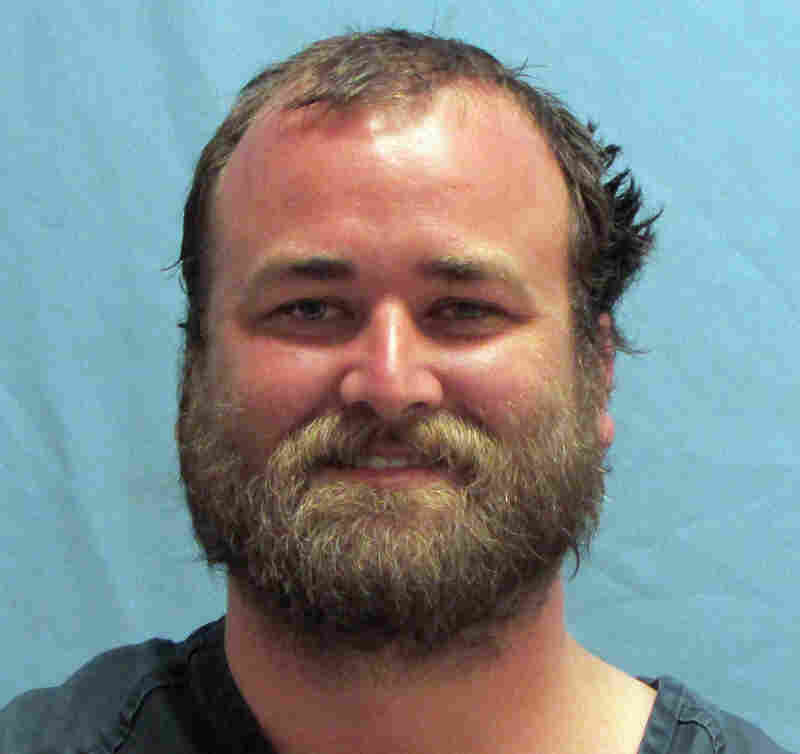 Police said Wednesday that Reed was cooperative during his arrest and that, so far, there is no indication of motive. The erection of the privately funded monument has been contentious. The Arkansas Legislature passed a law in 2015 requiring the installation of the monument on Capitol grounds. The Ten Commandments were erected Tuesday morning, and the ACLU of Arkansas has said it will sue for the monument's removal. Meanwhile, Powell said Capitol workers are left picking up the (extremely heavy) pieces: "Our crew is in the process of cleaning all that up and carting it off. They have to get a tractor and put it on pallets and lift it up." And the Dodge Dart was towed away, Powell said, adding, "There was minor damage, but not what you'd think, from what I hear, from knocking over a big stone monument." Republican state Sen. Jason Rapert, who spearheaded the effort to install the Ten Commandments monument at the Capitol, says he wants to replace it, Michael Hibblen of member station KUAR reports. "We will rebuild the monument," Rapert said. "It will be put in place and hopefully protect it from any future harm."